Designing a nursery is an exciting part of preparing for your baby’s arrival. And while it can be easy to lose track of time searching for baby nursery ideas online and through baby magazines, there are some practical items that every nursery needs. Here are four important things that all new parents should consider when setting up a nursery. If you have the option, decide which room in the house is the best place for your nursery. Think about choosing a quiet room that is close to your bedroom. You may not think that it’s a big deal now, but when your new baby is crying at 2 a.m., you’ll be thankful that you chose a room that’s a short walk away. Also, consider spending a night or two in the room that you’re planning to convert into a nursery. Do the windows let in a lot of sunlight or is it near a streetlight? Black-out blinds or curtain linings could be a great investment! Put the crib close to the entrance of the room. When you need to tend to your baby in the middle of the night, you don’t want to risk tripping over something on the nursery floor. Keep the changing table close to the crib. When you need to change your baby’s diaper, you won’t have to carry him or her across the room. Double the amount of storage that you think you will need. Take measurements of the room and save them on your phone. You might run across something that you need for the nursery when you least expect it! It’s important to remember to shop for functional first, aesthetics second. That white, fluffy area rug may perfectly fit into your sky / cloud nursery theme, however – after a couple of your baby’s inevitable accidents – you might realize that a darker rug may have been a better purchase. Also, you may want to choose furniture that can transition with your baby as he or she becomes a toddler or child. Arrange the nursery so that any piece of low-standing furniture (i.e., playpens and cribs) are away from windows that have blind cords, window drapes or curtains. Use a baby gate that either screws into the wall or doorframe for stability. Never use an accordion-style gate that is diamond- or V-shaped, as these pose a risk to your baby. Even if you think the furniture in your nursery is steady, prevent it from tipping over by using anchors or braces to secure it to the wall. Also, use childproofing latches on any drawers that your baby can reach to prevent him or her from opening and using the drawers as “steps” to climb the furniture. 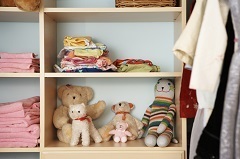 Store items such as baby powder, lotion, alcohol-based hand gel, and any other supplies that might contain toxic ingredients on a high shelf or in a drawer, out of your baby’s reach. It’s possible that your baby will be susceptible to any of the parents’ allergies. Take this into account when you are making any purchases. For example, a hardwood floor with a removable rug that can be cleaned might be a good option versus a completely carpeted room that could harbor allergens.